Boy oh boy there are some amazing changes being made and I can't wait to share all the news with you. As most of you know I am a Design Team member with the Speed Craft Challenge. Well, the entire format for the blog has changed and we are now Mixed Media World. The DT is the same except we have a new and the wonderfully talented Georgie C joining us. Welcome Georgie - I have checked our your blog and so looking forward to getting to know you. I must confess I am really going to miss the Speed Craft Challenge however I am also super excited for all the new things that are happening and I ultimately hope you will be too. You will find all new information on our new challenge blog and this is the link HERE. This is my first project for our new Mixed Media World Challenge. It was so much fun to create this project and by time I was finished my craft table was a mess and I had molding paste, gesso, paints, inks and other stuff all over my hands. Mixed media is something that has always intrigued me however I always felt so intimidated in giving it a try. I honestly believe being part of the Speed Craft Challenge is what helped me to just jump into the deep end a give it a try. I say this because the timed challenges forced me to "Just Do It" (like Nike says) and trust the process. And I am so thankful for all of it. I have started a new Mixed Media Journal and it is my goal to complete one page a day at least 5 times a week (hopefully more). My honey tells me when he looks over to see what I am working on my I am smiling big and my eyes sparkle. So why not stop on over to Mixed Media World and say hello. Check out the rest of the Design Teams Projects and FYI - they are all AMAZING. Maybe leave them a little love comment. If you have any questions - just ask us. And please consider joining in our challenge this month. "Anything Goes" as long as it's Mixed Media. Thanks so much for stopping by. Let me know what you think about Mixed Media and if you have jumped into the deep end yourself. I would really love to hear your story. And last but not least - our Mixed Media World is a monthly challenge. Oh thanks so much Donna. I really appreciate your sweet comment. I appreciate the sweet comment Deborah. I am so excited for all of us on this DT for Mixed Media World. Thanks so much! 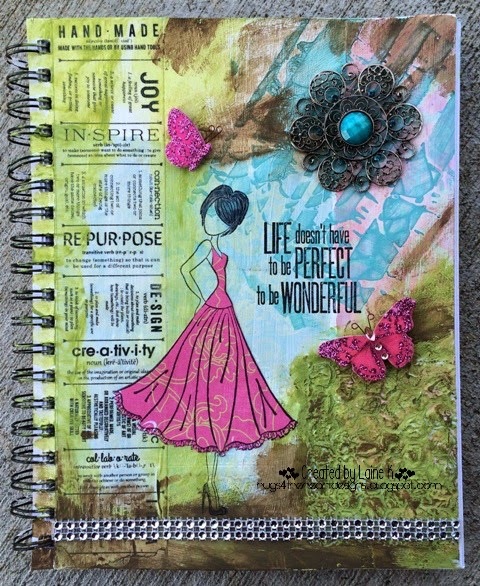 Love your style Laine, enjoying seeing your Julie Nutteg girl looking so cute an a gorgeous journal page. Great debut piece, think you have nailed mixed media already. Enjoy playing, keep up the smiles and sparkly eyes Teamie, love your inspiration. Huge Congrats on your first DT post for our new challenge. Oh thanks so much Ingrid. I appreciate your compliment!! It means so much to me. And sweet lady you really did knock it out of the ball park with your new blog creations. Absolutely stunning and the colors are so fabulous. I am so sad to hear about the demise of The Speed Challenge, Laine. :( But your mixed media journal is going to be a fun and wonderful project. Love the cover and that's such a fantastic sentiment! Looking forward to seeing where it takes you. Love the new Mixed Media look to the challenge, and what a fabulous page of inspiration - delicious! Gorgeous journal page Laine, love how you have moved from dark to light on your page, fits the sentiment perfectly! I've recently discovered mixed media myself and am now totally hooked, so glad to have found your new mixed media challenge blog so I can have even more fun!